Cortesy: Degotelo Studios. Ivelisse Cruz (left) y Master Yosvany Pérez (right). 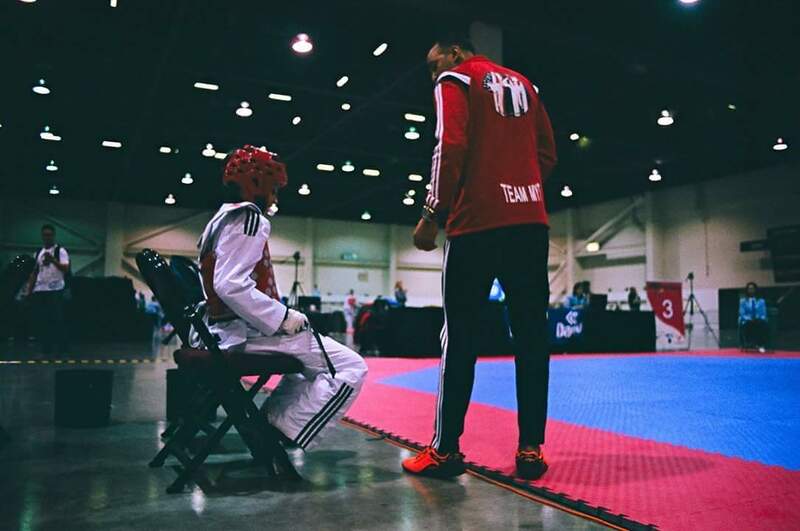 How do you feel as an athlete in a Taekwondo match? Emotions before and during a match involve anxiety, thoughts about the preparation, motivation, and expectations expected of oneself. Emotions can affect our performance positively or negatively, depending on how we channel them. These are controlled by the nervous system, which releases hormones into regions of the brain by activating the 'fight-or-flight response'. This response results in: an increase in heart rate, respiration, muscle tension, and sweating, along with a decrease in digestive and intestinal functions1. What stimulus does the athlete detect and how does the nervous system interpret it? Focusing is the key to be able to listen to the coach and analyze the opponent's movements guided by your hearing and vision. Hearing is activated when the auditory nerve in the ear sends signals to the brain2 to turn them into a representation of our surroundings3, in this case the opponent. Meanwhile, we create a barrier that suppresses background noise to focus on the match4. Scientists believe that the nervous system regulates how emotions are tied to intuitive behavior during stress5. In other words, the coach's suggestions and our intuition during the match encourage us to react appropriately. How does the athlete respond in fractions of seconds? Vision is the sense that determines 80% of how we perceive and respond to a stimulus during physical activity6. Also, it helps us predict the opponent's reaction to our attack. The visual skills we develop in training allow us to react quickly and accurately during the match, as we have been exposed to that action. The ability we have to identify and process what we see determines how fast we react and how efficient the techniques and tactics we use in the match6. Taekwondo is mainly characterized by standing on one foot to kick and move, kicks with hip twist and turns directed at the opponent's body or head. How does the nervous system allow us to execute a kick that looks so artistic? Different signals from the inner ear to the brain control: 1) our body posture to modify breathing and movement during a movement 2) immediate reflexes to adjust balance 3) focus and fixed vision on the opponent while we are moving7. Do you remember about where an athlete kicks off by keeping his posture on one foot and in turn blocks a kick with his opponent's turn? This execution depends on our muscles, balance, spatial orientation and motor memories. Continuous training produces motor memories that are generated in the cerebellum to correct our posture, movements and balance according to previous motor errors7. This is why high-performance athletes dominate certain combinations of kicks in the match with less difficulty. Finally, do you think you can recognize the components of the nervous system in your own experiences? Ral K. Auditory critical periods: A review from system’s perspective. Neuroscience. 2013; 247: 117–133. Al-Mana D, Ceranic B, Djahanbakhch, Luxon LM. Hormones and the auditory system: A review of physiology and pathophysiology. Neuroscience. 2008; 153 (4): 881–900. Kamal Hijazi MM. Attention, Visual Perception and their Relationship to Sport Performance in Fencing. J Hum Kinet. 2013; 39: 195–201.